In other papers published in the 1920s, Hubble solidified the case for extra-galactic nebulae as stellar systems comparable to, or somewhat smaller than, the Milky Way, lying at distances measured in millions of light-years. He enlarged the number of known Cepheids and novae in these remote systems and, as the data accumulated, he repeatedly pointed to what he called the principle of the uniformity of nature. The period-luminosity relation for Cepheids ''functioned normally'' in the ever more distant nebulae that he studied, and the distances it gave were consistent with those he derived from other criteria, such as the luminosity of the brightest stars in any given system. The principle of the uniformity of nature could therefore be used as a guide in ''extrapolations beyond the limits of known and observable data,'' Hubble suggested, and speculations based on such assumptions as the universal validity of the period-luminosity relation were legitimate unless they led to self-contradictory conclusions.31 Using the principle of the uniformity of nature, Hubble planned to explore ever-deeper regions of space, using the better-studied, nearer nebulae as stepping-stones to more distant worlds. The 1920s saw the Hubbles put down roots in San Marino, near Pasadena. Grace's well-to-do parents paid for the construction of a house near the magnificent estate of Henry Huntington, now known as the Huntington Library, Art Collections and Botanic Gardens. The Hubbles hired an architect to design a house reminiscent, in its proportions and plan, of apartments in the Palazzo Vecchio in Florence. Hubble's newly increased salary made it possible for the couple to choose furnishings for their house on their trips to Europe. The Hubbles' lives were not as easy as might appear, however. As their closest friends and neighbors knew, they tried to start a family when Grace was in her late thirties. Sadly, she delivered a premature, stillborn baby. The couple remained childless thereafter. Hubble was not successful at getting the IAU to endorse a revised classification system for extra-galactic nebulae when the Commission met in Cambridge, England, in 1925. In 1926, he went ahead and published it anyway, as a paper entitled ''Extra-Galactic Nebulae.'' Along with the paper read by Russell at the 1924/25 meeting in Washington, announcing the distance to the Andromeda nebula, this is one of Hubble's most famous publications. Although many of Hubble's peers viewed with suspicion his identification of galaxy types with stages in an evolution described by Jeans, his categorizing of galaxies — his recognition of salient features — has stood the test of time. As before, he divided the multitude of observed forms into ellipticals — formerly called the ''amorphous'' types—and spirals. A small number of nebulae, lacking any symmetry, fell into the category of irregulars (see figure 9.3). The ellipticals, which he designated by the letter E, appeared completely nebulous. They range from perfectly round forms, which he labeled E0, to flattened ovals with a long axis three or four times the short axis, which he designated E7. 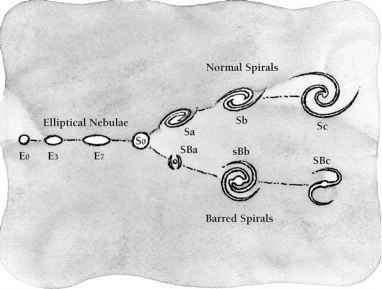 The spirals or S forms consisted of nebulous nuclei (bulges, in today's nomenclature) surrounded by spiral arms in a flat disk. These too he subdivided according to distinct features. The ''early'' spirals, Sa types, have a large nucleus or bulge, and nebulous arms tightly coiled about it. ''Middle'' or Sb spirals have a smaller bulge and somewhat more loosely wound, clumpy arms. ''Late'' or Sc type spirals have a small bulge and uncoiled arms that appear grainy rather than nebulous. Hubble also distinguished the spiral-barred or SB types, which resemble their normal spiral counterparts, except that the arms appear to emerge not from the bulge but from the ends of a bar across the central region. These are similarly labeled SBa, SBb, and SBc according to the size of the bulge and the appearance of the arms. The irregular galaxies often appear grainy (stellar rather than nebular) but they lack distinct arms or rotational symmetry. Hubble again insisted that he had developed the classification system purely on the basis of observational criteria. 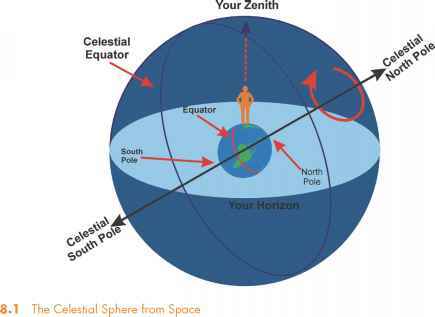 However, he drew his readers' attention repeatedly to the close agreement between Jeans' theory and the characteristics he observed, such as the resolution of the outer regions of the spirals into stars, while the central region remained nebulous. This attempt to connect theory and observation put off some of Hubble's fellow astronomers. Hubble's peers were right to be concerned, particularly about the direction of the proposed evolution from simple to complex. Indeed, in 1927 the Swedish astronomer Bertil Lindblad challenged that aspect of Jeans' theory on at least two counts. Lindblad did not agree that the bulges of spirals were truly nebulous, devoid of stars, and secondly he argued that flattened or disk forms would, over time, acquire a more globular shape — just the opposite of what Jeans proposed. Furthermore, we understand now that the present appearance of galaxies is due to both ''inherited'' characteristics, such as the density of the cloud from which they formed, and environmental characteristics, such as the number of encounters they have had with other galaxies. Neither Hubble's nor Jeans' scheme takes galaxy interactions into account, but the idea was around as early as the 1920s. Another Swedish astronomer, Knut Lundmark, who had spent two years at Lick and Mount Wilson in the early 1920s, conducted a statistical study of galaxies. The study convinced him that galaxy encounters with their nearest neighbors in space are important factors in their evolution. However, despite the problems with its theoretical underpinnings, Hubble's classification scheme was, and still remains, a useful one. The morphological features that Hubble based it on do relate to the age and evolutionary history of galaxies. The scheme is appropriate for objects Hubble could observe with the 100-inch telescope: galaxies some 10-14 billion years after their formation.